Reel Talk Online: Trailer Debut: "Transformers: Dark of the Moon"
Trailer Debut: "Transformers: Dark of the Moon"
Summer 2011 blockbuster movie season is well under way. 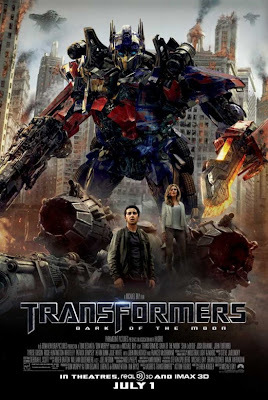 And here's another one to satisfy your popcorn appetite: the third installment of the lackluster Transformers series, Transformers: Dark of the Moon sans Megan Fox and add Rosie Huntington-Whiteley (in place of Fox), John Turturro, Ken Jeong, and John Malkovich. They're going hard on this one. And, you know what? It actually looks kinda good (but all the good scenes may be right here in this clip). See for yourself. Transformers: Dark of the Moon hits theaters July 1. This trailer looks absolutely stunning and epic! Now I am looking forward to this movie even though I am not a fan of other Transformer movies! IT does certainly look like an improvement. Nice post and great blog! I'll admit it. I like the Transformer movies! They're good fun. Although Rosie's facial expressions aren't doing much for me. I wonder if she'll be better than Megan Fox.